Poland was introduced to the Epcot International Food and Wine Festival in 1996. This recipe for pierogis was featured on the 1998 menu. Mound flour on kneading board and make hole in center. Drop eggs into hole and cut into flour with knife. Add salt and water and knead until firm. Let rest for 10 minutes covered with a warm bowl. Divide dough in halves and roll thin. Cut circles with large biscuit cutter. Place a small spoonful of filling a little to one side on each round of dough. Moisten edge with water, fold over and press edges together firmly. Be sure they are well sealed to prevent the filling from running out. 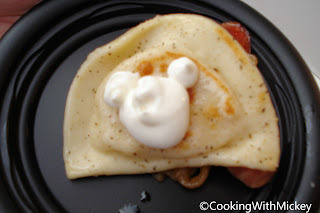 Drop pierogi into salted boiling water. Cook gently for 3 to 5 minutes. Lift out of water carefully with perforated spoon. Force cottage cheese through a sieve. Mix with other ingredients thoroughly. Cut kielbasi into 2 oz. portions. Grill until done. Serve with pierogi and sour cream.